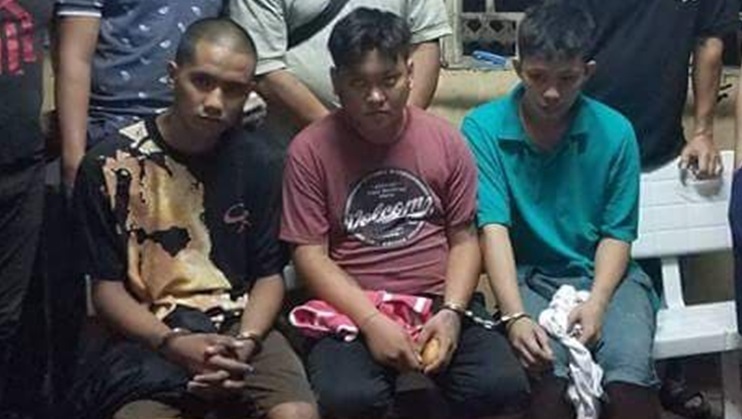 The three alleged drug personalities (l-r) Jay Lopoy, Devon Carl Somosot and Robert Dy, Jr. were arrested by agents of the Bohol police Provincial Intelligence Branch during a drug buy-bust operation in Tagbilaran City on Monday night. Two suspected drug dealers were arrested after they were allegedly caught in possession of shabu worth P675,000 in a drug buy-bust operation led by intelligence officers of the Bohol Provincial Police Office (BPPO) in Tagbilaran City on Monday night. Police identified the suspects as Devon Carl Somosot, 30, and Robert Dy, Jr., 28 who were arrested along with one of their alleged buyers, Jay Marno Lopoy, 28. According to the BPPO Provincial Intelligence Branch (PIB), they were monitoring Somosot for alleged involvement in illegal drug activities when they spotted him selling shabu. A police poseur-buyer then bought drugs from Somosot worth P1,000 but it was Dy who handed over the packet of suspected shabu. Both were immediately arrested and taken into police custody following the staged drug transaction. Lopoy, who was in the vicinity, was also arrested for illegal drug possession. According to police, they seized from Somosot and Dy 45 grams of shabu contained in one large pack, two medium-sized sachets and three small packets. The confiscated contraband had an estimated street value of P675,000, police said.